Today we bring you the absolutely incredible story of the founding of quite possibly the oldest decorative rubber stamp company in America – Hero Arts. Aaron Leventhal tells us the story of his mother – a single mom and determined entrepreneur – and how she started a true cottage industry in the bathroom of a Berkley apartment in the mid 70s. I remember ordering for the local store I managed and talking to Lei ;) Wishing him success in his new adventures!! Awesome story- so cool to hear it all- thank you aaron! I loved the Hero Arts story. My first stamp back in the 1980s was a Hero Arts stamp which I bought from a local stationary store! I was so excited.. and I still have it today! Thank you for a great story. I started slowly as a scrapbooker because one day I walked into an Archivers store. Then my niece was getting too busy with children and sold me a whole lot of stamps and inkpads. That was it. I was hooked on making cards. When I started buying stamps from stores, I always seemed to gravitate to the Hero Arts designs. They looked like “me”. The quality was always the best and I still buy them. Awesome chat and I was happy to hear the beginnings. This industry has got to be THE BEST out there! You would think that competitiveness would open up battlefields yet instead, companies thrive off of each other’s successes and build on them as an entirety. I thoroughly enjoyed this chat and have so much respect and adoration for all you crafty companions who make the industry what it is. Truly inspiring in every sense. Amazing and inspiring man. I could have listened to him all day. I will support Hero Arts more in the future because of the things I learned about the company from this chat. I look forward to your second date! Another amazing interview! Am totally enjoying the chance to learn all that goes on in the inside of these companies and love the fact that it is such a giving environment. I look forward to the ‘second date’ with Aaron and others who will give voice to this wonderful hobby. Wow! I SO enjoy these Crafty Chats! I truly appreciate hearing/learning about the foundation of the hobby I love! I know that I have heard Jennifer say, on many occasions, about the uniqueness of the stamping industry in that people are so kind and helpful. I believe that to be true. And, I guess that it makes sense that people in the industry are this way–after all, ultimately, all that we create and “save so much money” on, are to give to others! We create to give! Thanks so much Lydia, Kristina, Jennifer and Aaron and everyone at Hero Arts! An amazing story and an amazing and inspiring company, thanks for this wonderful chat with Aaron and for giving us a peek into the inner workings of this industry we all love. My stamping love started with Hero Arts too. I am grateful for the heart of people like Aaron. Looking forward to part two! My first stamp was Hero Arts, from 1989. I still have it! :) What a great story and crafty chat. Listening to Aaron tell the story of Hero Arts brought back so many memories of my years as a college student in Berkely. I remember getting started with stamping using Hero Arts, and All Night Media back in the 80’s. In fact, I still have a stamp from that era that has always been my favorite, but not sure who made it, and it still works! Wow! Your story brought back a lot of memories! What fun to hear the history of Hero Arts in those early days. I remember that Hero Arts were some of my earliest stamps, back in the early 80’s and I still have all of them now. Having lived in the Bay Area near Berkeley for the past 32 years, it was also great to know that it all started here! This story brings such hope to everyone! To do what his mother did and take that step out in faith. How awesome! I have never purchased Hero arts products. Only because I wasn’t aware of them. I have heard about them but kinda grouped them in with all the other stuff. Not really thinking about their back ground! This was great! This story is so heartening!! My first stamps were Hero Arts! I shopped for stamps on Telegraph Ave. in the late 1960’s – early 1970″. Bet I met your Mom! I grew up in the east bay and bought my first Hero Arts stamp at a home party back in the late 70’s or early 80’s and I think I might still have that set. I go to the Store in Richmond and buy stamps, stencils and dies at the Hero Arts store in Richmond. I really like the staff at the store. I have lots of stamps and stencils and dies. What a wonderful education and so heartwarming. This interview is so interesting and inspiring. I’m a history buff and just thrilled to learn about the beginning of hero arts business. I look forward to seeing their stamp & die sets at Joann fabrics here in northeast Ohio where I have bought some. This hobby is for any age & I’m just now getting started in it & I’m sixty years old and look forward to teaching our granddaughter who’s interested in making “love “ cards. This was heartwarming to listen to… and I too got a littler teary eyed… family is all important. One of the first stamps I bought was a Hero Arts stamp to use on my students graded papers way before I got into card marking. Yup, my first stamp set was four cubes of a Christmas theme and a red and a green cube of ink. I was so frustrated that I couldn’t make the set look like anything but a stamp with color on a piece of paper! A few weeks later a women was demoing in a store and the rest is (a very expensive!) history! How interesting! I loved seeing the first catalog/brochure! What a wonderful chat. Aaron has created a wonderful legacy for his mom. While listening to this chat I searched through some of my oldest stamps. I really wasn’t a stamper but I like the images. To my surprise, I found that all of my old wooden stamps were by Hero Arts. Ahh I love it. Thanks for sharing. I had no idea this compnay had been around sfor so long. Congrats. This was a great interview. I never knew the roots of HA but I started wayyy back in the day when we only had a black ink pad and use index cards and construction paper to make cards. Still have some very old Hero stamps and a few foam mounted ANM sets! Loved the chat video, very interesting and glad it ever started. without the efforts of the founders in this industry I wouldn’t be able to have so much fun stamping and making someone else smile thanks to a hand made card. Thanks for inspiring and educating us. 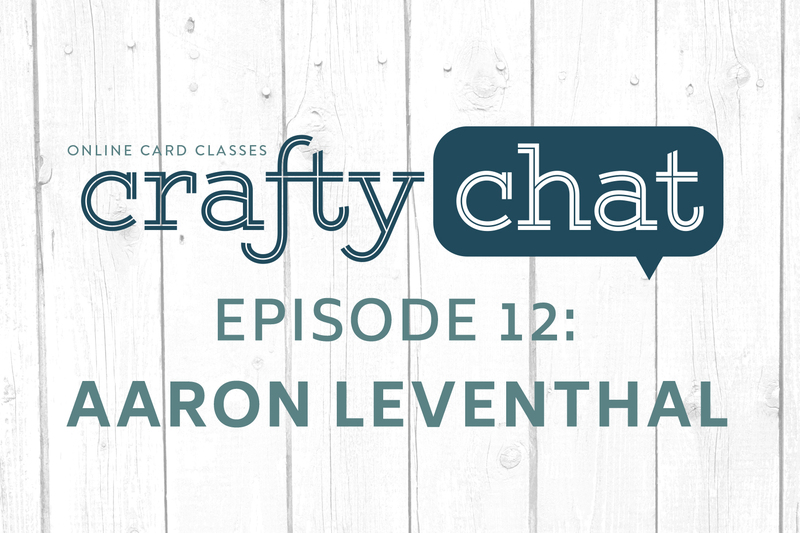 Terrific interview with Aaron Leventhal and the history of Hero Arts started by his mother Jackie. This is an inspiring story of taking a career chance based on a creative passion. Thank you for exciting our world today with your stamps. I have been buying rubber stamps for as long as I can remember..Probably 45 years…Love stamping can’t wait for the summer catalog. Love Hero Arts. I started almost 20 years ago. My grandsons baby shower. My daughter got the idea that we should make our own invitations for the baby shower. I knew nothing about card making and I am now making invitations? I thought, oh no, these will be a disaster, but low and behold, they were beautifu! I got the card making “bug”. That started it all! Now I make cards for all occasions and truly love it! Nice video. I’m looking forward to the next one with Aron. I like that HA sometimes does little interviews with their employees on their blog. It’s neat to get to know them a little bit. I remember it well…it was 1983, my son was 6 months old (he’s now 36) when I bought my first stamp. I loved that at the end of the day even though everything I did daily was undone, (clothes, dishes or diapers got dirty or needed to be fed again) anything I stamped was there for me to enjoy or share. It was something beautiful and lasting in my mundane life as a young mom. I know something about single-parenting, so I really admire Jackie. this was so interesting, Aaron, thanks so much for sharing your time with us. I appreciate Hero Arts so much! I started stamping in 1996, when my husband retired and we started spending the winter in San Diego. I enrolled in a community education class, and the rest is history.